Maple syrup is a sweet condiment made from the sap of maple trees, common in North American cuisines. It is most often eaten with pancakes, waffles, or French toast. Maple syrup is also commonly used on hot breakfast cereals including oatmeal, cream of wheat, and grits. Sometimes maple syrup is used as an ingredient in baking or in preparing desserts. 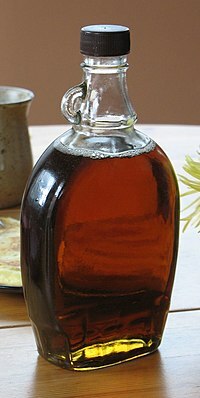 Most "maple-flavored" syrups on the market today in the United States are imitation maple syrups, usually with little (for advertising purposes) or no real maple content. They are usually thickened far beyond the viscosity of real maple syrup, as well. Real maple syrup is universally considered superior, although it is more expensive. Real maple syrup comes from Canada or northern United States, especially New England (states in the northeast corner of the US) and New York. Most maple trees can be used as a source of sap, but the sugar maple (Acer saccharum) and black maple (A. nigrum) are the most favored, with professionals preferring the black over the sugar. A maple syrup production farm is called a sugarbush or a sugarwoods. Sap is boiled in a "sugar shanty", "sugar shack", or "sugarhouse," which has only has partial side walls, being louvered at the top to vent moisture-laden air. The province of Quebec in Canada is by far the world's largest producer of maple syrup, producing 15,600,000 litres in 2001 - about four times as much as all U.S. production combined. In Quebec, the process has become part of the culture, and city people often go to cabanes à sucre in early spring, where lavish meals are served with maple syrup accompaniments. Tire sur la neige is a seasonal treat of thick hot syrup poured onto fresh snow then eaten off sticks as it quickly cools. Owing to its economic importance, the maple tree is an emblem of Canada, and its leaf is depicted on its flag. As for American production, in 2001, Vermont produced 1,040,000 liters of real maple syrup, about a quarter of the U.S. production. Maine and New York state, with about 19 percent each, were next in line. Production is concentrated in February. It takes approximately forty parts sap to make one part maple syrup. A very small amount of fat (usually with a pat of butter) is added during the reduction process to reduce the tendency of the boiling sap to froth up. The earliest runs are the best quality. The best "sugaring" weather is clear, with days above freezing and nights below freezing, also with snow on the ground. Syrup made late in the season, when there are no longer nighttime freezes, is dark, and the flavor is said to be buddy, which decreases its value. The whole process must be done as quickly as possible. Too much time in storage can induce fermentation in the sap, and too much time boiling can also reduce quality. Usually the whole process from any batch of sap finishes in syrup within just a few hours. Maple syrup is sometimes boiled down further to make maple sugar, usually sold in pressed blocks, and translucent candy. This page was last edited on 22 March 2019, at 15:18.